The specimen had lost its label at some point in the past, so I had to identify it myself and was hoping to get your opinion on what it might be. When I first saw it I noticed an odd scar running diagonally across the top of the cranium, which made me wonder if it was some kind of marine bird with an odd salt glad. Then I realised that the scar indicated something else entirely, which gave me the clue I needed to make the identification. It seems that most of you also noticed the scar and came to similar conclusions, so 23thorns, cackhandedkate, Ric Morris, Jake and Steven D. Garber all recognised it as a woodpecker of some sort and given the length of the skull rachel and henstridgesj arrived at the same conclusion about species as I did, which is the Green Woodpecker Picus viridis Linnaeus, 1758. Woodpeckers as a group are remarkable for a variety of reasons. Not least for their ability to bang their head hard against a tree and not suffer extensive brain damage. They achieve this by having a range of features in their skull to stop the forces from banging the brain against the cranium. These include spongy plates of bone in parts of the skull that absorb force, asymmetric force transmission in the bill and finally a peculiar feature that relates back to that scar I mentioned earlier – the hyoid bone. The hyoid is a bone that is found in the throat of tetrapods that is derived from one of the gill arches in fish. It plays a role in swallowing and vocalisation and in some lizards and birds it provides a rigid support for the tongue. In the case of the woodpeckers the tongue is very long indeed, with a barbed spear-like tip for harpooning insects. This long tongue has a long hyoid, that projects both forward and backward from the attachment in the throat. 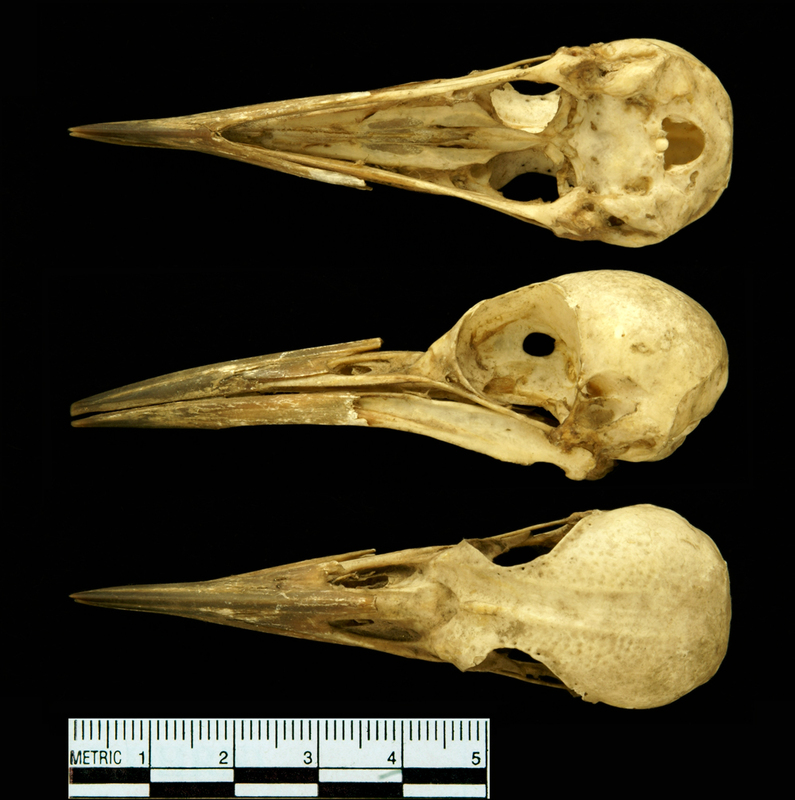 It actually projects so far around the skull that the rear hyoid horns sometimes pass through the right nostril of the bird. It is the positioning of this hyoid and tongue structure that leaves the scar on the cranium and it the same structure acts as a shock absorbing belt around the skull. It can be hard to visualise this, so I suggest checking out Rusty Ryan’s explanation. The information about the shock absorption in the skull comes from research by Wang et al. 2011, which is not always easy to follow due to the international brand of English in use (even the title doesn’t really make sense) so here is a sanitised version of the outcomes courtesy of the BBC. 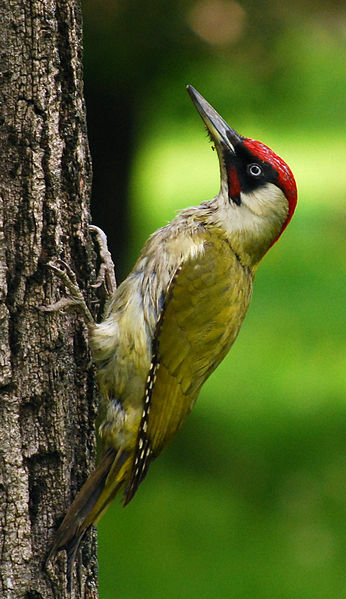 Green Woodpeckers are quite striking birds, that are less keen on head-banging than the other British woodpecker species, relying on ant nests for food more than standing wood. Because of this dietary preference they don’t have the barbed spear tip to their tongue, relying instead on sticky saliva to trap ants on their long and rapidly darting tongue – just like a variety of other ant-eating animals.